In most countries, the design and construction of all aspects of the built environment are regulated by rules and procedures which help prevent failures. When compared to the volume of construction undertaken, the number of failures of buildings and other structures is thankfully small. However, failures do occur, some making headline news, and for a variety of reasons. Information about such failures is vital to make construction - whether it be an office block, bridge, tower or reservoir - even safer. 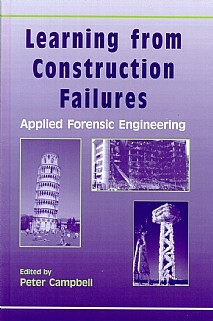 This book has been written by a number of distinguished international experts and considers many facets of what has become termed forensic engineering. Numerous case studies and examples from across the world, from Pisa to the Oklahoma bombing, cover not only modern buildings, structures and elements, but some buildings that can truly be described as historic. The spread and depth of topics covered is remarkable and illustrates the importance of this subjhect in modern engineering design. Professionals and students in civil and structural engineering, construction, architecture and design and related disciplines.